The Oyster-catcher ( AFR: Swattobie) is one of those birds that cannot be confused with any of its neighbors, for its brilliant black plumage and red-orange beak, eyes and legs tells you immediately who they are. The first oyster-catcher I ever saw was a baby bird, not long out of its shell, but already able to toddle about. In fact it toddled too far and had passed near a sitting tern-so near that the tern was annoyed and savagely pecked the tiny youngster, sending it sprawling across the pebble rocks. Fortunately, the problem of what to do with this unfortunate little chap was soon solved for sweeping close to my face, a black bird angrily shrieked “kleep, kleep, kleep”. It was one of the parents. Very anxiously the parent bird flew down to take charge of its precious youngster, but whether it was mother or farther I did not know, for both sexes are much alike. Since that day I was intrigued by these beautiful shore birds. They generally lay two eggs, so closely resembling the pebbles, that it takes the keenest of eyes to find them. 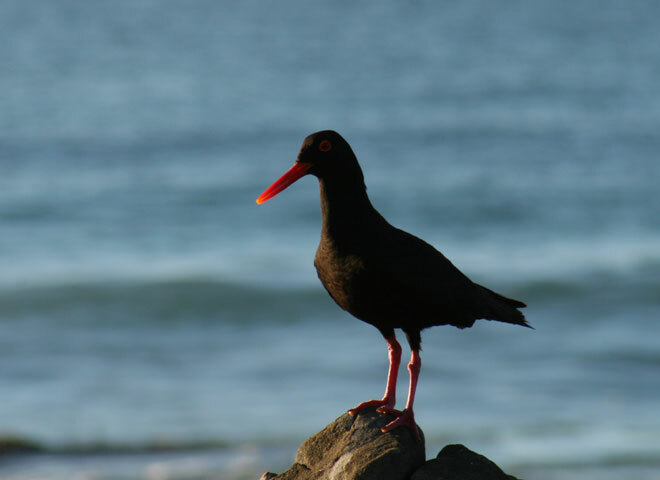 The only nest an oyster-catcher ever makes consists of a few shells collected together. Some oyster-catchers do not even bother to do this and only make a saucer pan hollow in the sand so that the eggs cannot roll away. This is also being the reason for their declining numbers that made them end up on the Red Data list for Endangered Birds. In the eighties there were less than 5000 (2000 breeding pairs) oyster-catchers left. Their numbers have increased dramatically after a law has been passed prohibiting 4×4 vehicles on the beach. Having to sit on the eggs during hot weather must be a tiresome job, but they remain on duty hour after hour. Happily, both birds share the work Although the married couples are very much in love with each other, it is not often that both are seen at the nest together. On several occasions, however, I have seen them change places on the eggs. Joyfully the going-off duty bird then flies down to the sparkling waves. When coming back to its eggs, the oyster-catcher take great care not to show anybody where they are. Taking a zig-zag course, the cunning birds flies great distances out of its way, sometimes running and sometimes walking, rather than give away the secret of its nest. Indeed, the oyster-catcher will try to lead you away from its nest and many an anxious beachcomber followed the bird in hope of discovering its secret but after it has misled them a long way it gives a loud laugh and takes to wing. 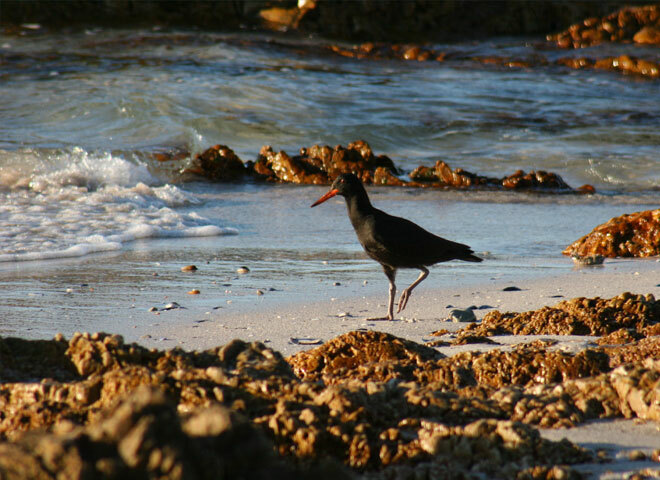 Oyster-catchers have an unusual migratory pattern that still baffles scientists. After losing their feathers the juvenile birds will fly all the way to Namibia and the south of Angola in search of a mate. This flight for some can be up to 3000 kilometers, the only migratory route of its kind in the world. Up north they will stay in colonies for 2 – 3 years before returning to our coasts. The oyster-catcher’s voice is shrill and high-pitched and its whistling call seems to come from different directions. It is a very vocal bird at all times. When a group of them comes together each seems to try screaming louder than its mates, a noisy piping chorus! Yet there is always something cheery and bright about oyster-catchers, particularly when groups of them gather together on the surf and play the strange little games only they understand. Even in winter, when the sky is grey and the sea cold and foamy, oyster-catchers are to be seen in crowds, bringing joy and happiness to those watching them. Unlikely as it may seem,oyster-catchers eat limpets, mussels, cockles, periwinkles, worms and insects, in fact anything but oysters. Mussels seem to be their favorite food. • Oldest known oyster-catcher male is 28 years. They might even live longer.